It has now been about a decade since California passed the Global Warming Solutions Act in 2006 and followed it with the supporting Sustainable Communities and Climate Protection Act in 2008. These landmark pieces of legislation, AB 32 and SB 375, set goals for the reduction of greenhouse gases statewide and for improving the ways in which we plan our communities. Yet California is falling short of its climate goals. 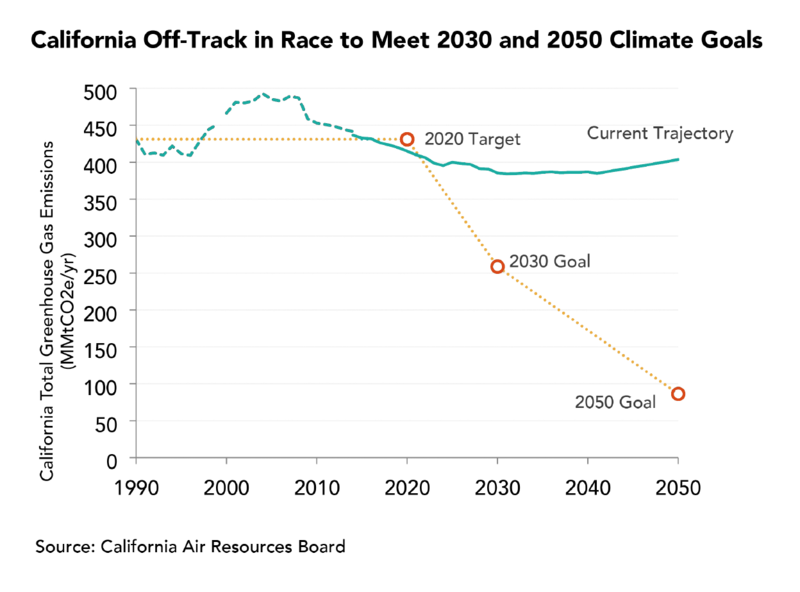 Recent data from the California Air Resources Board shows that the state failed to meet the 1.0 percent required reduction in emissions in 2014 and is well behind the 5.2 percent per year reduction required to meet its 2050 goals. If the state’s level of greenhouse gas emissions continues on its current trajectory, by 2050 over five billion additional metric tons of carbon dioxide will be emitted—the emissions equivalent of 57 million passenger vehicle trips to the moon. One of the main causes of California’s failure to achieve its climate goals is sprawling land use patterns driven primarily by local barriers to producing sustainable, affordable, transit-oriented housing—especially near major job centers in the coastal communities of Los Angeles, San Diego, and the Bay Area (which is the focus of this analysis). The lack of compact development has led to increased sprawl, the consumption of inland greenfields, and substantial increases in traffic and congestion as people commute farther to work. A set of studies partially funded by the Environmental Protection Agency found that compact development could reduce vehicle miles traveled by 20 to 40 percent and could reduce emissions from transportation by 9 to 15 percent by 2050. If the state’s level of greenhouse gas emissions continues on its current trajectory, by 2050 over five billion additional metric tons of carbon dioxide will be emitted—the emissions equivalent of 57 million passenger vehicle trips to the moon. Transportation is the largest contributor of greenhouse gas emissions in the state of California and is responsible for 160 million metric tons of carbon dioxide per year, or 36 percent of the state’s total. That share is even higher in the state’s coastal metros. The transportation sector accounted for 40 percent of total emissions in the Bay Area and 34 percent in the Los Angeles region. A reduction in emissions in the transportation sector is therefore essential to achieving the climate goals outlined in AB 32. Failure to build in Priority Development Areas — The primary goal of SB 375 is the reduction of passenger vehicle miles through building within Priority Development Areas. Despite a goal of 80 percent the Bay Area was successful in locating only 54 percent of permitted housing units within PDAs. This situation prevails for a variety of reasons—most stemming from local policies—including high land costs, delays in the approval process, development fees, and code requirements. 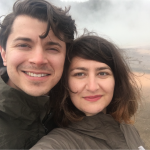 Outsourcing of housing to inland regions far from job centers — The high cost of housing in coastal communities has pushed many residents to look farther inland for more affordable housing. Comparable housing in the San Joaquin Valley can be had for one third of the price in the Bay Area. As a result, the number of commuters crossing regional boundaries within the Northern California megaregion on a daily basis has grown by 78 percent since 1990, with most of those trips being by car. California can no longer ignore another inconvenient truth: its climate goals are being undermined by land use regulations that block infill, while sprawl remains easier and less costly and is therefore growing more quickly. The state must either immediately change land use controls statewide to facilitate infill development or be prepared to redirect efforts toward megaregional growth planning that includes hundreds of billions of dollars of immediate investment in infrastructure to support interregional commuting at scale. By all measures, California’s economy is booming. With the sixth largest economy in the world, the state is leading the nation in job growth and is a magnet for the world’s most innovative companies and the talented individuals that want to work with them. However, California’s red-hot economy has exacerbated housing and transportation crises, leading to concerns about keeping the state on track to meet its ambitious climate goals. In 2006, California was the 12th largest emitter of greenhouse gasses (GHGs) in the world, despite having the highest energy efficiency standards in the nation and being a world leader in environmental regulation. In response to this, the California legislature and Governor Arnold Schwarzenegger passed Assembly Bill 32 (AB 32), the California Global Warming Solutions Act of 2006. This landmark piece of legislation reaffirmed California’s commitment to addressing climate change by requiring emissions in the state to be drastically reduced by 2020. At its core, Assembly Bill 32 requires a reduction in GHG emissions to 1990 levels by 2020. This reduction—equivalent to approximately 15 percent when compared to a “business as usual” scenario—is to be achieved through proportional decreases in emissions from all sources within the state. Notably, the law also established what is known as a “cap-and-trade” system for managing the production of emissions by industry, and it contained provisions for achieving these goals while maintaining a robust economy. In order to fulfill the objectives of AB 32, there would need to be a significant reduction in emissions from passenger vehicles, which account for 70 percent of all transportation-related emissions and are the largest source of GHG emissions in the state. Recognizing this, the California legislature passed Senate Bill 375 (SB 375), the Sustainable Communities and Climate Protection Act of 2008. Senate Bill 375 was written to support the goals of AB 32 by coordinating land use and transportation policies at the regional level in order to lower GHG emissions through a reduction in vehicle traffic and congestion. The California Air Resources Board (CARB) was tasked with developing regional reduction targets in passenger vehicle emissions, while the state’s Metropolitan Planning Organizations (MPOs) developed regional plans to achieve these reductions, known as Sustainable Community Strategies (SCSs). Each SCS is designed to integrate transportation, housing, and land use policies at the regional level in order to better position jobs and housing with the goal of reducing emissions. The establishment of Priority Development Areas (PDAs) is a central component for achieving this goal. These PDAs are intended to absorb the bulk of new housing construction within a region and, in turn, guide the region’s transportation investments to serve future residents more efficiently. The Bay Area’s strategy—known as Plan Bay Area—projects that by 2040 the Bay Area will grow by over 2 million people, add 1 million jobs, and build over 650,000 units of housing. The plan identifies nearly 200 PDAs intended to be the focus of the majority of the region’s future housing and population growth. In order to meet California’s climate goals, it is essential that the majority of new housing be built within the identified PDAs. 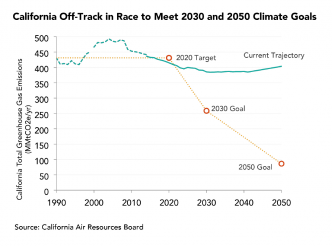 Despite ambitious goals, California and the Bay Area have had only limited success at bending down the emissions curve. In 2014, GHG emissions in the state fell by less than one percent, and vehicle miles traveled (VMT) increased, surpassing the previous peak reached in 2007. Vehicle miles traveled in the Bay Area are also trending in the wrong direction and, as a result, congestion is increasing. The slow reduction in emissions is in part due to California’s strong job recovery, coupled with an inability to match that strength in housing production, especially in coastal regions that tend to be job centers. In the 30 years spanning 1980 to 2010, the average metropolitan region across the nation increased its housing stock by 54 percent, while coastal metros in California increased their housing stocks by an average of 32 percent. San Francisco and Los Angeles produced housing at an even lower level, adding just 20 percent to their overall housing stocks. A lack of housing supply in desirable regions and job centers causes prices to rise and residents to look farther and farther from central cities to outlying areas, which are often areas less served by transit. 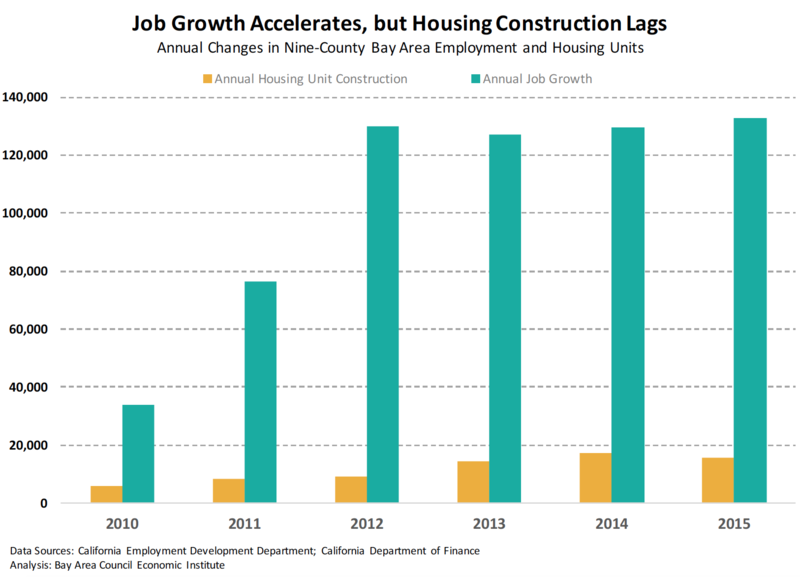 These trends are particularly evident in the Bay Area, where the region’s exceptional job generation has fueled the strongest economic recovery in the US but has not fueled a parallel growth in housing units. 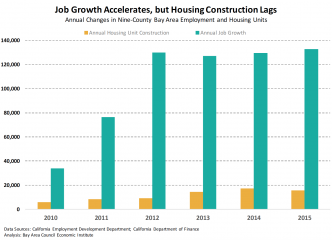 In 2015, the Bay Area economy added 133,00 jobs but only 16,000 units of housing. The surge in demand and the dearth of supply have caused home prices to soar and anyone who does not own their home to become increasingly at risk of displacement. The median home price in the Bay Area is now $712,000, up 80 percent since 2009, and is fast approaching the pre-recession peak of $729,000 in 2007. Congestion in the region is also on the rise, climbing 33 percent from 2010 to 2014. The Bay Area is now tied with Los Angeles in hours of traffic delay and congestion cost per commuter and ranks just behind Washington DC, the most congested region in the country. In 2013, over 100,000 commuters in the region traveled 90 minutes or more to reach their jobs. In order to plan for and monitor housing production, state law requires that local governments adopt a housing element as a part of their general plans. Each jurisdiction in the state must conduct a Regional Housing Needs Allocation (RHNA) assessment—a state-mandated process intended to identify by affordability level the total number of housing units that each jurisdiction must build in order to make room for new residents and maintain affordability. Under SB 375, a majority of these units are to be built within PDAs. Priority Development Areas were established by SB 375 to support future growth in a sustainable manner. Identified and approved by local cities or counties, these areas within existing communities are typically accessible to transit, jobs, shopping and other services. 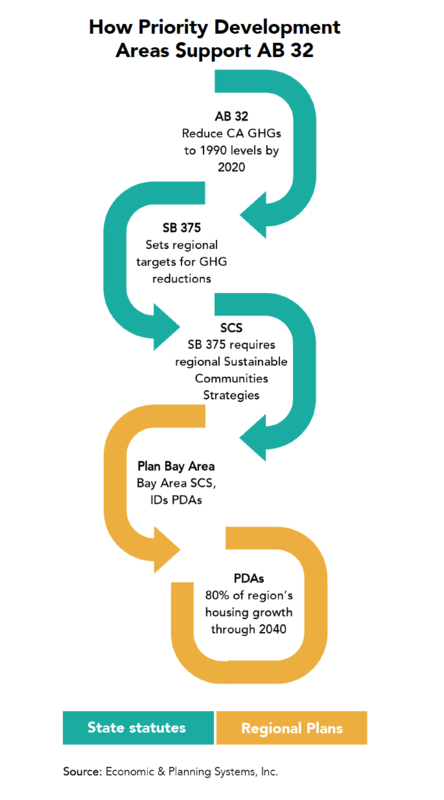 Under Plan Bay Area, over 70 local governments voluntarily designated nearly 200 PDAs which are intended to absorb about 80 percent of new housing and over 60 percent of new jobs on less than 5 percent of the Bay Area’s land. 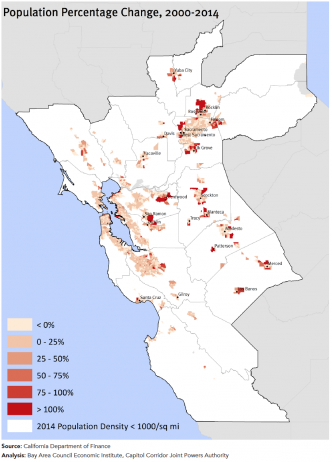 The overall intended results are locally-supported, compact and efficient growth patterns that meet GHG reduction targets and provide adequate housing for the Bay Area’s growing population. As a whole, the Bay Area was only successful in permitting 57 percent of its allocated housing during the 2007–2014 RHNA cycle, leaving a deficit of 91,402 units. The majority of the unpermitted units (90,057) were allocated to be affordable for very low- to moderate-income households. Given the significant time and effort put into planning for infill development, the slow progress on housing development within PDAs is striking. During the first two years of Plan Bay Area’s implementation, only half (54 percent) of all permitted housing was located within PDAs. A recent sample of 65 PDAs conducted for Plan Bay Area found that only 235,000 of 337,600 allocated housing units were likely to be built by the 2040 deadline. 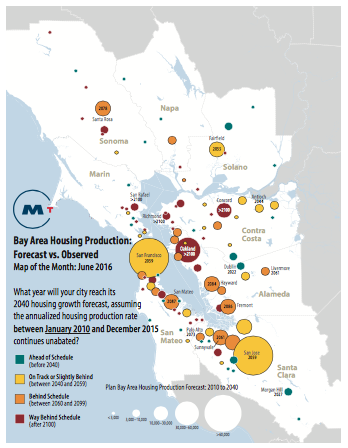 As the MTC Bay Area Housing Production map shows, the majority of cities in the Bay Area are significantly behind in meeting their RHNA obligations. Only a quarter of the region’s cities are on track to meet their targets, and many of them are smaller communities, accounting for a relatively small number of units regionwide. If the rate of new housing construction continues at the pace it did between 2010 and 2015, San Francisco won’t fill its housing allocation until 2044, just behind the 2040 deadline. However, it will take San Jose until 2068 and Oakland well into the 2100s to meet their allocations. Plan Bay Area and RHNA projections have also significantly underestimated the levels of job and population growth the region has seen. Based on the construction rate from 2010 to 2015, the region won’t meet its 2040 housing allocation until 2065, while jobs in the region reached the level projected for 2020 five years early. The Bay Area’s strong economy and weak housing growth have contributed to the region’s runaway housing costs, and home prices in the region are increasing faster than incomes. 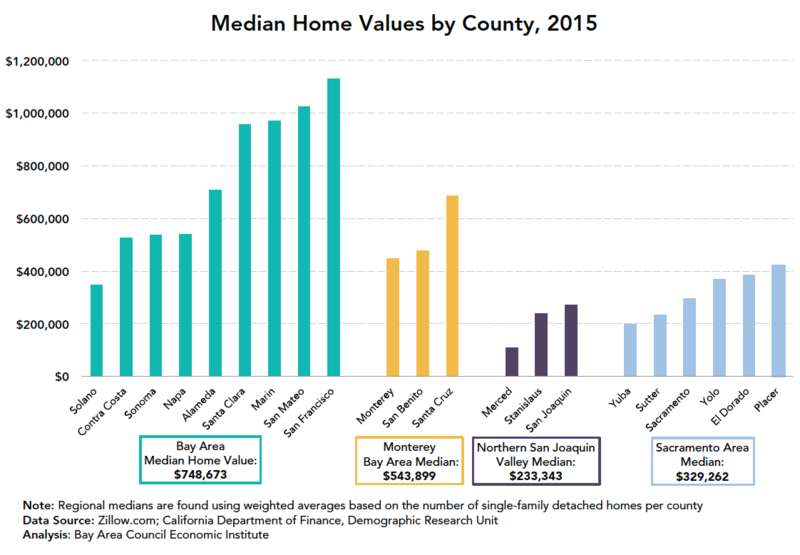 The Bay Area median home price is currently three times higher than the median price in nearby San Joaquin County. As a result, the Bay Area has begun outsourcing a portion of its housing obligations to the farthest reaches of the region, and even into the Central Valley. Composed of 21 counties grouped into four regions (Bay Area, Sacramento Area, Northern San Joaquin Valley, and Monterey Bay Area), the Northern California megaregion includes three of the fastest growing counties in the state. San Joaquin, Santa Clara, and Yolo counties were the second, third, and fourth fastest growing in the state in 2015. The California Department of Finance projects a continued population influx into the Sacramento and Northern San Joaquin areas in the years ahead. With inland regions leading the way, the Northern California megaregion is expected to add nearly 1.9 million additional people by 2030. While the megaregional workforce has increased by 17 percent between 1990 and 2013, the number of commuters crossing regional boundaries has grown by 78 percent. Due to a lack of inter-regional transit, the vast majority of these workers are commuting by car to jobs in the Bay Area. 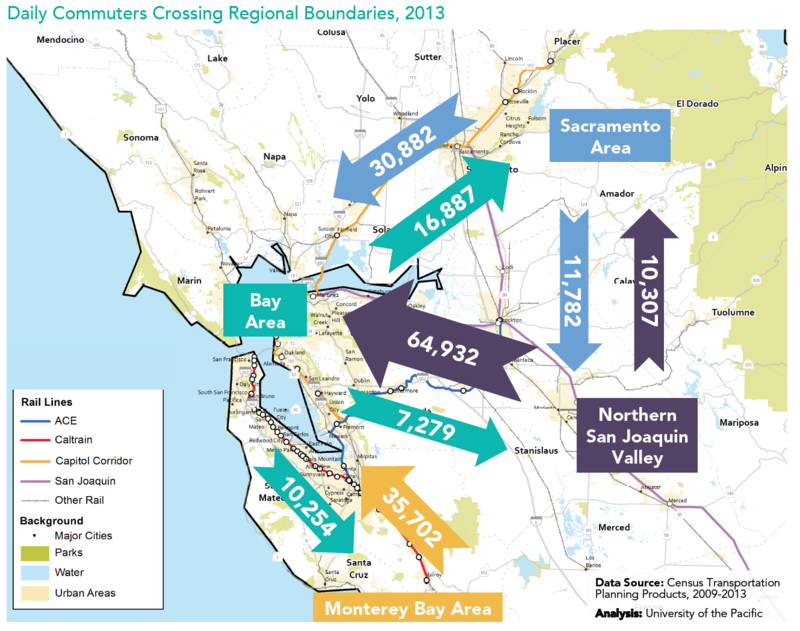 Of the nearly 200,000 commuters crossing regional boundaries in 2013, 69 percent were commuting into the Bay Area for work. Intraregional commute times are also rising, as transit and roads strain to accommodate increased traffic. The end result is undermining a decade of planning for climate change. While California’s coastal communities have underbuilt for decades, inland metros such as Bakersfield, Fresno, Riverside-San Bernardino, San Joaquin, and Sacramento have built housing at almost twice the rate of the average metro nationwide. Much of this is a result of a combination of lower land prices, lower production costs, and more available land zoned for housing. A high cost of living, primarily driven by high housing costs, has pushed many Bay Area residents to look for cheaper locales, including areas out of state. And because of the relative affordability of housing inland, many have had no choice but to relocate from urban areas to exurban areas within the megaregion. The California Department of Finance projects that the Central Valley’s population will increase by 4.7 million by 2050, nearly twice the rate of growth as California as a whole. This outsourcing of housing and its consequences have occurred despite the goals of SB 375 and years of planning efforts by MPOs. If development patterns continue in this fashion, significant investments in transportation will be needed to slow GHG emissions, and even then, 2050 reduction goals will be hard to meet. In addition to hindering state climate planning, the failure to build adequate housing in the state also has implications for future economic growth and for the state’s and the region’s ability to attract and retain the necessary labor force. It also raises significant concerns regarding displacement and equity. Rapidly increasing housing costs drive displacement and inequity. These effects only increase with the lack of additions to the housing supply, as the number of units essentially remains fixed and more households compete for those units. While many local nexus studies suggest that displacement occurs because of new development, the recovery of the Bay Area economy and the creation of over 500,000 jobs without parallel increases in housing is more likely to be a driver of displacement than development in and of itself. As new workers press into existing neighborhoods that lack new housing, they increase demand for scarce housing units, causing prices to rise. The levels of price increases seen in Bay Area cities have left many low-income households with no option other than relocating. The lack of mobility resulting from high home prices is also a significant driver of inequity. Higher housing prices make it more difficult for individuals and households to move to areas with greater opportunity than the places where they currently live. This reduces dynamism within the economy and results in a smaller number or residents, often existing residents, being able to capture the economic benefits of living within the boundaries of a community. It also results in first responders and teachers living farther from the communities that depend on them, lengthening their commutes and weakening their connection with those communities. While the megaregional workforce has increased by 17 percent between 1990 and 2013, the number of commuters crossing regional boundaries has grown by 78 percent. A 2005 analysis found that if every available infill parcel in California were developed to its fullest potential, the state would gain 4 million additional housing units—meeting all projected demand until 2025, while simultaneously sparing 350,000 acres of undeveloped greenfield. The benefits to the climate would also be significant. Research has shown that more compact development coupled with investments in transit could reduce GHG emissions from passenger vehicles by 7 to 15 percent, while also reducing energy costs significantly. Despite these benefits, the Bay Area has fallen behind on its infill housing goals. So why does the Bay Area perennially underbuild housing—particularly the transit-oriented infill necessary to achieve the state’s long-term climate goals—and why is housing so expensive? The primary driver of the high cost of housing in the Bay Area is a decades-long underproduction of housing in the region. The Bay Area’s high quality of life, robust economy, and world-class universities and research institutions mean a near-constant demand for more housing. There is simply not enough housing in the region to support the number of households that want to live here. Normally, rising home prices would signal developers to build additional housing stock. This has not historically happened in the Bay Area. For example, rising home prices throughout the 2000s resulted in building across the country, even in markets similar to the Bay Area like Seattle. Yet while Seattle grew its housing stock at a rate of 1.4 percent per year during that decade, San Francisco and San Jose managed increases of only 0.7 percent per year. The high jobs-to-households ratio in the region also drives up demand and therefore prices. The Bay Area now has a jobs-to-households ratio of 1.36, meaning that the region has more jobs than employed residents living in the region. While a strong jobs-to-households ratio is indicative of a strong economy, a ratio as high as the Bay Area’s can cause pain points, especially in the areas of housing and transportation. The production cost of goods increases with the cost of the inputs required for their production. Housing is no different. In addition to the high cost of land in the Bay Area, various other factors that increase the cost of building include long delays during the approval process, development fees, building code requirements, and high risk premiums due to the significant risk of any single development not being able to move forward for a variety of reasons. Any new housing construction first requires a site to build on, and the cost of land in California and the Bay Area is extremely high. Data from the American Housing Survey shows that in 2011, the cost of an acre of land in coastal California metros averaged $150,000, compared to $20,000 in the average US metro. By contrast, the cost of an acre of land in San Francisco was nearly $400,000. While land use and zoning regulations can be beneficial—for example, the goals of SB 375 would not be achievable without PDAs—overuse of them can contribute to high land costs by limiting supply. Minimum lot sizes, off-street parking requirements, height limits, and prohibitions on multifamily housing are all limiting to supply. The approval process is one of the most significant unknowns and therefore drivers of risk in the housing development process. Even when built within the confines of a specific plan and on a parcel zoned for the number of units proposed, a new housing development can face a variety of delays. Community resistance, board of supervisors and/or city council approvals, and lawsuits result in major delays, down-sizing, and often the cancellation of projects. Infill developments are particularly susceptible to these types of delays. One study found that 80 percent of all challenges made under the California Environmental Quality Act (CEQA) were against infill developments. In most cases, these developments would otherwise have accommodated population and economic growth in line with the goals of SB 375. Metropolitan regions with lengthy approval times were also found to have up to 45 percent fewer housing starts than those without. Additionally, for each one-month increase in expected approval time, a 13 percent reduction could be expected in the probability that a development would be completed. Development fees have increasingly become a way to ease concerns about displacement, fund affordable housing, and cover underinvestment in municipal infrastructure. These fees tend to be much higher for infill projects. However, higher fees and inclusionary requirements actually drive up costs for the entire region, and with the high cost of building, they fund a relatively small number of affordable units. In 2014, the City of San Francisco collected $29.9 million in “in-lieu” housing fees—fees paid by projects to support the development of additional affordable units offsite. At the current cost of construction, theses fees would only support the construction of 64 800 square-foot units. California has much higher building standards requirements than other states. Many of these standards are for overall building safety, and many are for energy efficiency. While these requirements accomplish many societal goals, their impact on building costs must be recognized. Decades of underbuilding and continual increases to the cost of building have resulted in a crisis of price. The purchase and rental prices of homes have climbed to levels unattainable for most lower- and even middle-income households. High building costs also mean that the subsidy required to build one unit of affordable housing in the region is abnormally high, so affordable housing budgets are exhausted while building very few units. Infill locations that can support high purchase and rental prices see some new housing construction, though not at the rate necessary to support the region’s growth. For other locations, prices must rise beyond the cost of building before construction can begin. For example, if construction of a mid-rise development requires rents of $5 per square foot, prices in the area for the rental of a 1,000 square foot one-bedroom unit must reach $5,000 a month to make economic sense. Once prices reach these levels, lower- and middle-income households can no longer afford them. Building costs, and therefore prices, are much different inland. By one measure, the median home price in the Bay Area was $749,000, compared to $329,000 in the Sacramento Area, and $233,000 in the Northern San Joaquin Valley. In inland areas, the lower all-inclusive costs of land, construction, fees and delay allowances mean that units can be more easily delivered at lower purchase and rental prices. Development follows the path of least resistance. As a result, many Bay Area residents have had no choice but to relocate elsewhere in the megaregion or outside of the state entirely. In order to meet the ambitious goals set by AB 32, the Bay Area must take a different approach to housing its growing population. By aggressively increasing the production of housing and focusing on Priority Development Areas, the region can reach its emission targets, strengthen its economy, and increase affordability and equity. The strategies below should be considered with the overall goal of building—not simply planning, or zoning, or even permitting—sufficient housing stock, particularly in Priority Development Areas, to meet the demands of a growing regional population and fill historic deficits. Strategy #1 – Streamline approvals for new housing developments that meet local planning and zoning requirements. Discretionary reviews and other appeals far too often delay or completely block developments that meet local planning and zoning requirements. Abuse of the California Environmental Quality Act is a prime example. Right-to-build legislation—like the Governor’s proposed “Streamline Affordable Housing” bill—is essential to making real progress in building new housing, particularly within Priority Development Areas. Strategy #2 – Cities must be held accountable for meeting Regional Housing Needs Allocations (RHNAs) and Priority Development Area (PDA) growth. Cities that meet their RHNA obligations should be rewarded, and there should be real consequences for failing to permit the required number of new housing units. Further incentives should be awarded to cities that streamline the approval process for new housing and bring units to market faster and at lower cost. Strategy #3 – The Bay Area must expand the stock of secondary units, junior units, “in-law” units, and other similar uses of homes and lots as an additional affordable housing resource. This is a quick and inexpensive way to add housing in a very short amount of time. These additions to California’s housing supply have low carbon footprints, are affordable by design, and can be placed into existing neighborhoods. Strategy #4 – The update to Plan Bay Area must have a strong foundation in the economic realities of development. In the first iteration of Plan Bay Area, there are too many instances in which development densities were recommended for locations where they were not viable given market conditions; local market rents are not high enough to support the proposed construction types in many areas. Strategy #5 – The fiscalization of municipal land use decisions needs to change. When Proposition 13 passed in 1978, revenues to local governments were cut by about 57 percent. 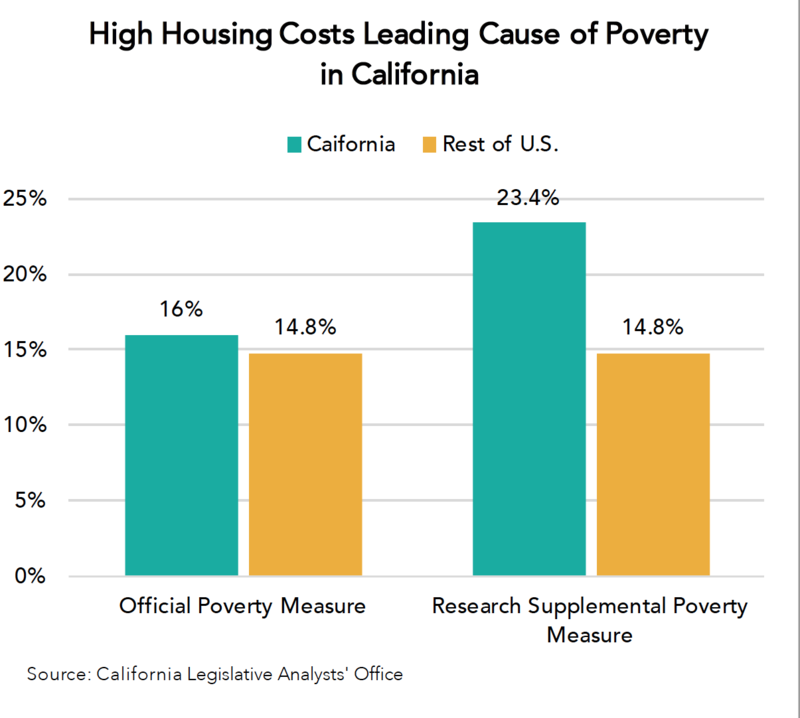 This forced towns and cities across California to look for new sources of funding for essential services and to avoid land uses that generate more demand for services than tax dollars. In the creation of their general plans, local governments turned to job-generating uses, hotels, and retail as preferable fiscal alternatives to housing. Local jurisdictions keep a much greater percentage of sales taxes and transient occupancy taxes than property taxes and, as a result, they now zone far too much land for hotels, stores, and auto dealerships. The demands for services such as libraries, schools, and other essentials are proportional to the housing in local jurisdictions, so even office uses are seen as preferable to housing because workers who go home at the end of the day to a different jurisdiction do not generate those demands for services locally. The notion that housing does not pay for itself may reflect reality in some instances, but as prices have risen in many areas of the region, housing increasingly generates sufficient taxes to support a broad array of services for cities. Strategy #6 – Policymakers need to reconsider discretionary costs added to the fixed costs of construction, especially if the construction of more housing—and particularly more affordable housing—is a priority. The cost of constructing a new home is driven by many factors: supply and demand, materials costs, labor costs, land acquisition costs, financing costs, parking mandates, municipal fees, lawsuits, and time. Some of these costs are inflexible, and there is little that can be done to change them via public policy. But other costs are driven by policy choices. Policymakers need to review some of these choices and make changes. Strategy #7 – Establish powers to acquire funding and assemble the necessary land for development in urban areas and in Priority Development Areas. With the loss of over 400 Redevelopment Agencies (RDAs) across California in 2012, it was estimated that California’s affordable housing developers lost $1 billion annually in funding to build much needed housing. Thirty-five of those RDAs also had the power to create one developable plot of land by assembling the sorts of small and oddly shaped parcels that are common in urban areas. Absent that power, it becomes more difficult for developers to acquire land to develop in urban areas and in Priority Development Areas. Strategy #8 – Require the Legislative Analyst’s Office to conduct an analysis on any legislation proposing an increase to the cost of new housing construction. California’s housing shortage is well documented, as are its consequences. In order to ensure that the shortage does not get worse, an analysis should be conducted of any new legislation that might increase the cost of construction or have other unintended consequences. Strategy #9 – Extend the state’s cap-and-trade program through 2050. California’s cap-and-trade program is essential for achieving its 2030, 2040, and 2050 climate goals. The program also provides essential funding for low carbon transportation, transit-oriented development, and affordable housing. Strategy #10 – Begin to seriously plan for the megaregion. Despite state planning goals, the growing megaregion has become the most rapidly accelerating new development pattern unfolding in California, and it can no longer be ignored. California’s planning goals, including building sustainable communities, will not be achieved without major additional changes to infill development control policies. Land use policies must change in a profound manner to allow more infill to occur more affordably, and state planning efforts must expand their scale to more effectively address megaregional growth.